Mom made sure each of her five kids had lots of cultural experiences of all kinds. High on my list of favorites was seeing Mummenschanz on Broadway. It’s a hard show to describe. The only word I can think of is magical. Or maybe surreal. I can’t wait to relive that bit of my childhood when the legendary Swiss theater troupe comes to the State Theatre in March! So it’s clearly no accident that I chose the performing arts as my profession. Like my mom, I’m passionate about introducing children to the arts. To me, there’s no more gratifying sight than hordes of preschoolers streaming into the State Theatre for The Very Hungry Caterpillar, or the Mayhem Poets making a packed house of high school students forget for an hour or so that they hate poetry. And then there’s Milk & Cookies. Our Saturday music and storytelling series for young kids has become a much-beloved institution here at State Theatre New Jersey. 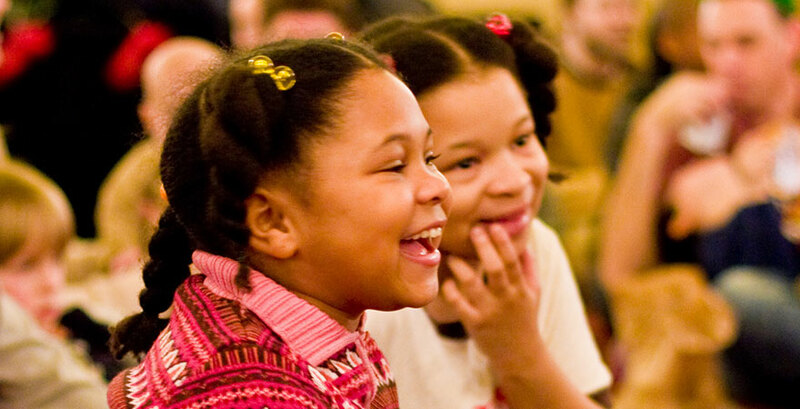 Over the past ten years, the program has given thousands of children their very first experience with live performance. It has, we hope, been the spark that kindles a lifelong love of the performing arts. Recommended for ages 3-8, Milk & Cookies is designed with young attention spans in mind. The setting is cozy and informal; in the Heldrich Room (the theater’s upstairs lobby), kids and adults can sit up close on the floor. (Thankfully for the less limber among us, chairs are also provided.) Milk & Cookies’ engaging storytellers and musicians really know how to connect with kids. Their performances always include lots of opportunities for the audience to sing, clap, and dance to the music, and help tell the stories. The shows are age-appropriate in length, too: about 45 minutes. Now that the holidays are over, it’s time to get ready for our next Milk & Cookies shows. The first one is coming up soon—Saturday, January 20, at 10am & 12pm. 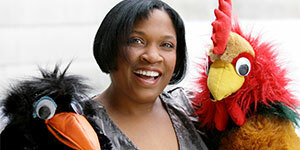 We’re pleased to welcome back a fan favorite, the multitalented Robbi Kumalo. As a singer, “Robbi K” has performed with a whole host of legendary artists, including Aretha Franklin, Eileen Ivers, Jewel, Diana Ross, Ashford & Simpson, Rod Stewart, Mary J. Blige, and Harry Belafonte, among others. One more thing… After you’ve taken your kids to a Milk & Cookies show, be sure to stop by Guest Services and buy your family tickets for Mummenschanz. Sponsored by Colgate-Palmolive and The Horizon Foundation for New Jersey.